Yes, it’s another flipping pancake post! But Pancake Day is very nearly here and I’m making the most of it. It’s one of my favourite days of the year as it’s a good excuse to indulge. English, Dutch, Scots, American, Breton, sweet, savoury – pancakes of any description are fine by me. Last week I made some savoury pea protein pancakes. Today I give you wholemeal spelt pancakes served with a sophisticated coffee cardamom chocolate sauce. I’m renowned for adding flavours to my pancake batter, but this time I wanted plain pancakes, so the sauce would speak for itself. Plain pancakes lend themselves to both sweet and savoury accompaniments, which is just what I want on pancake day. Some savoury, some sweet, all lush. Before smothering a stack of these wholemeal spelt pancakes in the luscious coffee cardamom chocolate sauce, I had a couple with a fried egg, tomatoes and chilli salt. Taste sensation! These wholemeal spelt pancakes use kefir and are super simple to make. The process was made even easier this time with a fabulous bundle of tools courtesy of OXO. I have a few OXO Good Grips utensils now and I use them all the time. They are sturdy, well designed and very comfortable to hold. The extra wide silicone pancake turner is fantastic and makes flipping pancakes a breeze. There is no danger of scratching non-stick surfaces and it glides under the pancakes with no fuss at all. I was also impressed by the white stainless steel mixing bowl, which has a non-slip base to avoid the bowl sliding whilst mixing. Other gadgets included in the bundle were a squeeze and pour silicone measuring jug, a balloon whisk, a silicone lemon squeeze & store and a 3-in-1 egg separator. The latter is a particularly nifty little gadget. It hooks onto the side of most bowls and can be used for cracking eggs, sifting out broken bits of eggshell and separating the eggs. Although I didn’t need to separate eggs for my wholemeal spelt pancakes, I had to give it a try anyway. The egg cracked easily and the white slithered down into the bowl whilst the yolk stayed behind. Last, but by no means least, I received a trigger ice cream scoop. I’ve been coveting one of these for a long time. I can never get the ice cream out of my current scoop. In this instance, I used the scoop for measuring out my pancake batter. Unless I’m flipping vegan pancakes, I use kefir to make my pancake batter. It always gives a spectacular fluffy result, even with 100% wholemeal flour. If you don’t have kefir, you can use buttermilk or watered down yoghurt. The other ingredients are few: wholewheat spelt flour, an egg, salt and raising agents. Once you have perfect plain pancakes, it’s all in the sauce. The sauce I used here is simple to make, though the taste is complex. Coffee and cardamom are a Middle Eastern classic. Combine them with chocolate and you have a match made in heaven, as you’ll know if you’ve tried my coffee cardamom chocolate mousse cake. So how about trying out my wholemeal spelt pancakes this Shrove Tuesday? 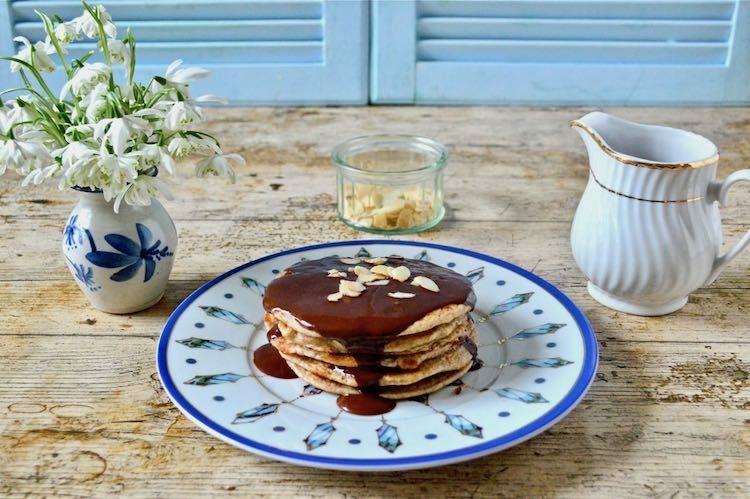 Fluffy wholemeal spelt pancakes made with kefir and served with a sophisticated coffee, cardamom chocolate sauce. Make a well in the middle and break in the egg. Add the kefir and whisk from the inside out until the batter is just mixed. Leave to rest for a few minutes, whilst you make the chocolate sauce. Lightly grease a non-stick frying pan and place over a moderate heat. Drop large spoonfuls of the batter onto the pan and cook for 3 minutes or so, when bubbles have appeared on the surface and the batter is almost set. Flip and cook on the over side for a further 2-3 minutes. Place on a plate and keep warm in the oven until they are all done. Warm the coffee and sugar together in a pan and stir until the sugar is dissolved. Turn off the heat and add the remaining ingredients. Stir until the chocolate has melted and the sauce is smooth. Leave to cool slightly, then pour over the warm pancakes. Sprinkle with the toasted flaked almonds. Thanks for visiting Tin and Thyme. If you make these wholemeal spelt pancakes, I’d love to hear about it in the comments below or via social media. Do share a photo on social media too and use the hashtag #tinandthyme, so I can spot it. For more delicious and nutritious recipes, follow me on Twitter, Facebook, Instagram or Pinterest. Like this recipe for wholemeal pancakes? Pin it for later. Post commissioned by OXO. I was not expected to write a positive review and all opinions are, as always, my own. Thanks to my readers for supporting the brands and organisations that help to keep Tin and Thyme blythe and blogging. Awesome! We just had some sourdough pancakes yesterday…going to make some more this weekend. Ooh sourdough pancakes sound a fabulous idea. I bet they’re good. Do you have the recipe on your blog? I really want to try using spelt flour after looking at this. I have in my head that it’s heavy in texture and flavour – I’m wrong aren’t I? Funny how you get an idea stuck. I love spelt flour. It’s been my flour of choice for many years now. I guess it just depends on the recipe you use, but I don’t find it to be heavy at all and most definitely not in these pancakes. And the nutty flavour is a bonus. But if you’re used to only using white flour, it may take a while to get used to it. Spelt is a brilliant flour. It’s particularly good for those with a low wheat tolerance and it tastes delicious. OMG that chocolate sauce looks so good – it has so many flavors going on. This is such a creative dish, can’t wait to try it! Thanks Karen. The chocolate sauce is the sort of thing you just want to eat out of the jar with a spoon. I’m so excited about Pancake Day. These look so delicious and those OXO products look great too. Thanks Jemma. Pancake Day is one of the best days of the year. The run up to it is pretty good too – plenty of opportunities to use the OXO tools. A life without pancakes isn’t worth living. Haha, it would be very sad indeed to have no pancakes to look forward to. Ooh, so many different things I’ve never tried before. Love the sound of using spelt and kefir to make pancakes and the sauce sounds divine. I love pancakes! And I love spelt flour. These look so delicious! Thanks Elaine. Spelt makes surprisingly good pancakes I find. You always make such interesting pancakes – I only ever make ‘normal’ ones (well, apart from the vegan ones, I suppose). I hope you give them a try. That chocolate sauce is fantastic. It’s quite a common combination with me, but yes it should be better known. The egg separator is brill. Yep…… Pancakes everywhere at the moment! But look at that sauce…. How tempting is that?! Post as many pancake recipes as you want – no one is going to argue there! I have a package of spelt flour just waiting for these! I love that they go savory or sweet – that coffee cardamom chocolate sauce sounds insanely yummy. Thanks Emily, spelt is my favourite all purpose flour and I use it for most things. Let me know if you make them. Oh my… that coffee cardamom chocolate sauce sounds so sooo good. Love that these pancakes are healthy and I could enjoy worry-free 😉 BTW, I like the ice cream scoop hack for pouring batter on the pan! Must remember that for next time I make pancakes. Spelt flour is epic. These look so good and that choc cardamom sauce. Hello!! 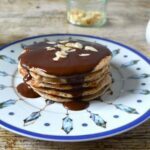 Spelt makes fab pancakes and yes, this is the best chocolate sauce – ever!